What is A One-Day Summit™? 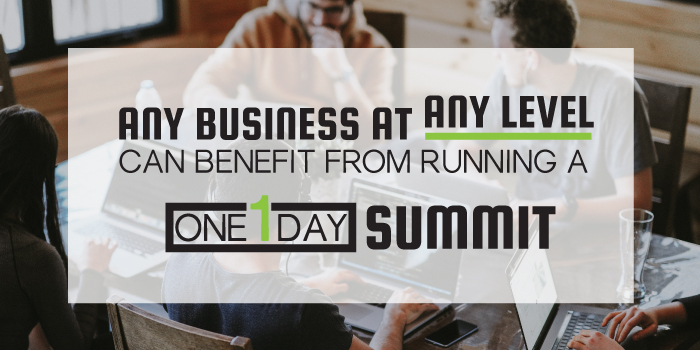 Why Run A One-Day Summit™? Who Should Run A One-Day Summit™? What Are Some One-Day Summit™ Examples? Offer How Do You Set It Up? 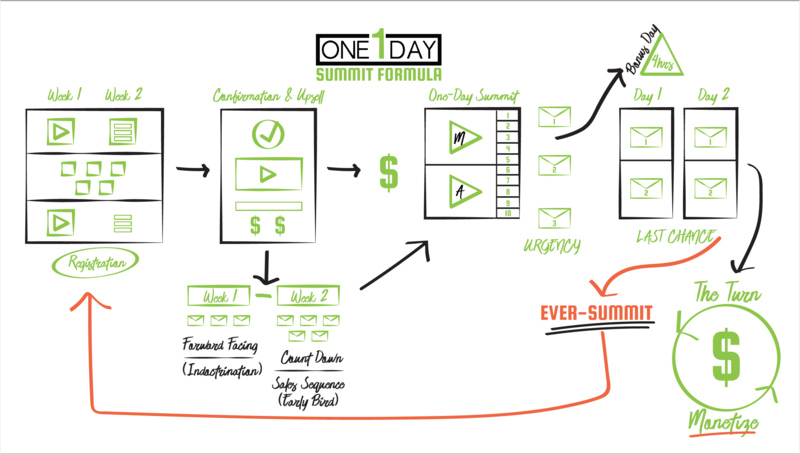 The One-Day Summit™ Formula is an online entrepreneurs PROVEN FORMULA to quickly grow your list, launch your platform or make more money (even if you are just getting started). Typically, a One-Day Summit is a pre-recorded online event packaged around solving a particular problem by bringing in experts and providing free information for a limited time to those needing the problem solved in exchange for their contact information. 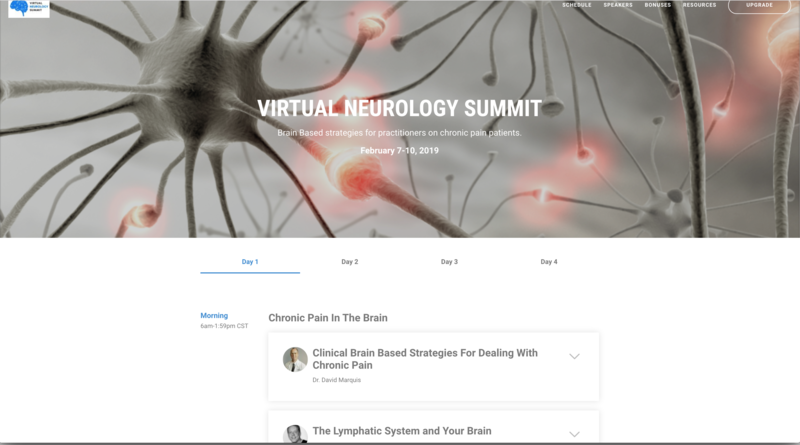 The primary purpose of a One-Day Summit is to highlight an acute pain point or problem of your ideal avatar and solve that problem in a short period of time while building a relationship with potential clients. Once you have your One-Day Summit created, you can offer it to the world. Depending on whether you are using the “List Builder” or “Premium Monetization” Strategy, it will either be free for people to opt in and participate or cost a small fee. Once a person joins your One-Day Summit, they will then be given access to a series of pre-recorded videos on the overarching problem being solved. Attendees will have a specific and limited amount of time to consume the information. They will be given the opportunity to upgrade to an advanced “membership” level that will grant them prolonged access to all videos. Most often, the purchase comes with additional bonuses and options. (With the Premium One-Day Summit extended access is included). Those who do not purchase the upgrade option will lose access to the information at the end of the designated period of time. This forced urgency increases engagement and the desired results of the completion of the provided material. Most commonly, One-Day Summits do not include the word “summit” in their name. They are often branded based on the problem or solution being solved, such as the “List Builder Accelerator” or “Neurology Fundamentals”– names that create interest, intrigue, or curiosity. A common misconception early on is that the One-Day Summit is a full day’s worth of content. While some are longer, most are relatively short to allow the audience beneficial time to complete the information and achieve the desired result (solution). 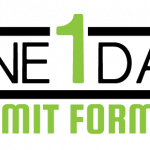 The name, “One-Day Summit™”, indicates the typical amount of time allotted for attendees to finish the information before it becomes restricted. based on solving a problem in a short amount of time (typically One Day). can include 5-16 expert speakers, with the sweet spot being 10.
only takes 30-60 days of prep to create. does NOT require advanced knowledge, skills, a team or a large budget. typically named “summit” but can be branded based on the problem. consists of anywhere between 3 – 10 days of speaker interviews. typically requires 30 – 80 speakers. based on building excitement and awareness on a variety of topics and problems. typically requires 6-12 months of preparation. reserved primarily for advanced online influencers with large teams, budgets and skill sets. Today’s digital listener has the shortest attention span in history. We are seeing a drastic drop in the effectiveness of webinars, lead magnets, and other online marketing strategies such as the typical online product launch. We are seeing an overwhelming focus on funnels that are aimed to highlight secrets. We have completely lost the focus on human psychology, which is to solve a problem and build a relationship. This is the backbone of business in any industry and niche. The One-Day Summit not only accomplishes these goals, but it also highlights you (the host) as the authority. The benefits of running a One-Day Summit are vast. The fact that this strategy is quick, nimble, and powerful makes it an impactful way to grow your audience and monetize your platform. But are there specific benefits to running a One-Day Summit in addition to growing your list and audience and making money? The answer is a resounding yes. Running a One-Day Summit makes you the host of your own platform. Like Podcasts and Live Events, we look up to those who are the host of their own entities. It’s a bit of a status symbol. Your audience will look at you with more authority in your niche and industry because you are the host of “X”. It has happened to many others in your same position. Relatively unknown or up and comers with a big vision launch a summit or a platform and immediately gain authority in their industry. They get asked to speak on other influencer’s platforms. “Expert Leverage” is when you accrue some amount of expertise and authority from others. This happens when your audience admires those hosted on your summit and accepts that you must also have some expertise or authority for them to agree to be associated with your event. You are leveraging the expertise of others who join your One-Day Summit. Authority is one of the quickest and most immediate benefits of running a One-Day Summit. With your One-Day Summit, you will be hosting select influencers and experts. This gives you the advantage of having a reason to reach out to potential influencers to give them an opportunity for new exposure by being on your summit. Many will accept this opportunity, giving you the ability to create a professional relationship with important influencers. Those who accept your invitation will be in direct contact with you both before and after your session. It is a very powerful way to build relationships and network with other strategic experts. The most obvious and often the most desired aspect of running a One-Day Summit is the opportunity to grow your email list with new subscribers. The primary concept behind the One-Day Summit is to attract new and old followers by solving an acute problem in a short amount of time. 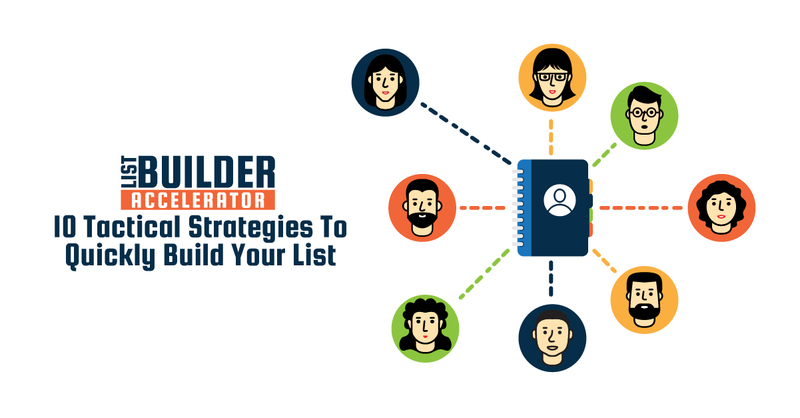 Using the “List Builder Strategy”, you offer a valuable opportunity for your audience to solve a problem for free with advice from industry experts in a format that is new and appealing. This creates a powerful and effective strategy to quickly build your list with engaged, quality new subscribers who now look to you as an authority. With the income options, it becomes one of the few opportunities to build your list with little to no cost per new subscriber. This is because of the money the One-Day Summit naturally generates. All businesses need to generate income to stay viable. The One-Day Summit gives multiple opportunities for income generation. The first is by providing free access to the videos for a specified and limited amount of time with the option to purchase ongoing access. The next option is by running a Premium One-Day Summit, which requires payment to access any of the information, but allows the customer to maintain access to it after purchasing. Once the One-Day Summit has concluded, it can now be sold as a product, similar to the way one would sell an online course. There are opportunities to position this now product in the sales cycle. It can be offered to affiliates to sell to their audiences in exchange for a commission. It can be offered as a flash sale opportunity to your audience. It can be offered as an up sale or down sale to other promotions you run. The true magnitude of a One-Day Summit is in the engagement and excitement it creates with an audience, preparing them for your next purchasing promotion opportunity. You can also sell appropriately-aligned affiliate products during and after your One-Day Summit to the audience. There is the opportunity to accept sponsors who align with your topic to be featured on your One-Day Summit in exchange for a sponsorship fee. 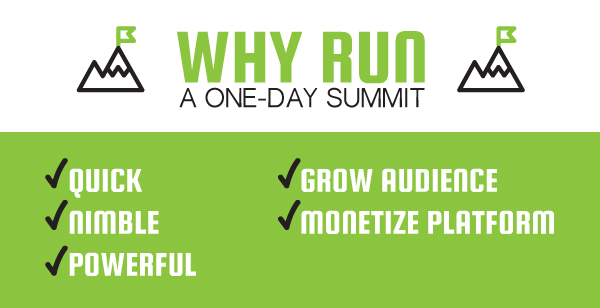 The opportunities to monetize your One-Day Summit are vast and powerful. Most online businesses struggle from the challenge of being unknown. They have a great idea, a vision, and maybe even a product, but no one knows about it. This is because they don’t have an audience of loyal fans who follow them and look to them for advice and guidance. In other words, they don’t have a platform. A platform allows you to share your message, vision, and strategies for your ideal avatars to improve their lives through your products or services. This has become even more difficult as many people try to build out an infrastructure in hopes of having a powerful platform. They have a website, their social media pages, funnels, etc. The problem is they don’t have the key ingredients. A One-Day Summit builds your platform and following through the most powerful strategy available. By building a relationship with an audience and gaining trust while solving a problem. Additionally, a One-Day Summit gives you the opportunity to pull audiences in from those participating on your summit. This allows you to tap into already engaged audiences and bring them into your platform through your One-Day Summit, using the above-mentioned strategy of Expert Leverage. When you host a One-Day Summit, you immediately have a platform, with a strategy to quickly build an audience. As mentioned above, once your One-Day Summit has concluded, it is now an actual product you can sell. Many people have difficulty deciding on and creating ways to sell their knowledge in exchange for income. A One-Day Summit creates a valuable resource that is simple to create and doesn’t require the host to do all the heavy lifting. It also opens up the opportunity to create additional products based on the one singular summit. A One-Day Summit allows you a unique opportunity to create both affiliate relationships to sell and promote your summit, as well as creating opportunities for you to sell other programs and products to attendees. The most common source of affiliates is the expert speakers who are participating in your One-Day Summit. They would be given the opportunity to promote your summit to their audience and in return garner a percentage of the commissions created from the attendees they deliver. Finding outside partners who want to promote your One-Day Summit works in a similar fashion. 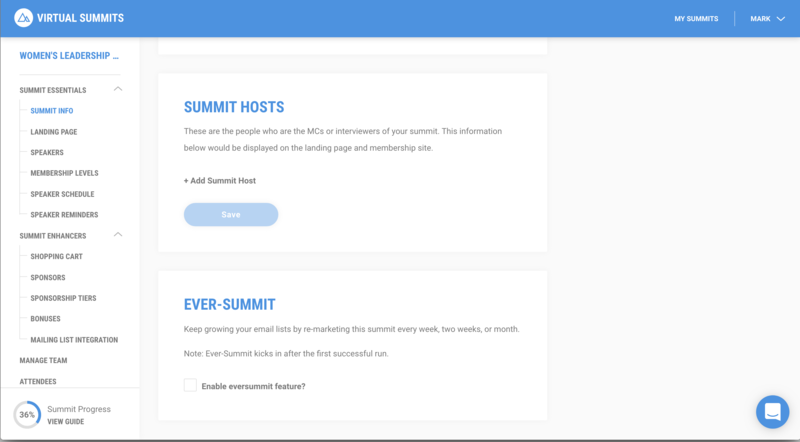 Lastly, finding additional or outside products and programs that align with the topic of your summit can be sold to the attendees by advertising them on the summit or in emails in exchange for commissions generated by these promotions. These opportunities open up future and ongoing relationships to promote your programs. Occasionally, companies will want and need opportunities to promote their products to their target audiences. Your One-Day Summit can be a great opportunity for those companies to highlight aligned products to potential customers attending your One-Day Summit. In exchange for exposure on your One-Day Summit, these sponsors would provide a value exchange in the form of a sum of money or other equal options. This creates an opportunity for you to generate more income from your summit while the sponsor gets exposure and potential new clients. One of the most valuable outcomes from running a One-Day Summit is the engagement it creates from the attendees. For a business to generate sales, it needs to create “know-like-trust” with potential customers. The best way to do this is by getting potential customer to engage with and get to know you. The One-Day Summit builds this engagement through communication sequences, the comment exchange, and interaction during the summits, plus the amount of time spent with you through watching the videos. This increased engagement and new status of viewing you as an authority increases the potential for ongoing sales. Probably the most important side effect of running a One-Day Summit is the relationship that is created between the attendee and you. There are two primary ways to create a relationship, both are based on spending time with the host. The first is through an actual interaction between the attendee and the host. The second is through the attendee spending time with the host through a recording. Both generate a feeling of connection for the attendee with the host. The more time the attendee spends connecting with the host, the stronger the relationship. The stronger the relationship, the more trust and willingness develops to do business. Your One-Day Summit allows you to generate strong relationships with potential customers all at the same time without the need for you to actually spend real time with each attendee. This allows you to velocitize your success and results. Who Should Run a One-Day Summit? The amazing part of a One-Day Summit is that any business at any level can benefit from running one. The amazing part is the power that happens at each of the different levels. Whether you have an online or a brick and mortar business, a One-Day Summit can help you increase your success. If you are just getting started, have good momentum or are already crushing it, a One-Day Summit just adds more impetus to your current status. We have seen every level of experience; knowledge and status all run successful One-Day Summits. Every niche and industry has the power to run an incredible summit. It all comes down to solving your audience’s problems. Let’s look at some of the specific scenarios. One of the most difficult things when getting started in business is building an audience: creating a group of people who know and want your services and are willing to pay for it. Most newbies start building and just keep building, doing anything and everything they can, hoping that it will attract an audience. Unfortunately, quantity is not the best strategy. At this stage we need to build an audience and grow our lists so that we can then begin to help people solve their problem and in return get paid for our expertise. A One-Day Summit is the most powerful way to build your audience. It uses the strategy of Expert Leverage that allows you to tap into the already engaged audiences of the experts participating on your summit. It allows you to promote a FREE solution to an acute problem, which people are in need of and willing to sign up for. It also gives you the ability to network with other influencers who can help you grow your influence by promoting your business and creating other opportunities. If you are in that beginning stage, there is no better solution to get the momentum going than by running a One-Day Summit. Now that we have an audience and some momentum, we are generating income and building a cool business. Now it’s time to start making some money. What tends to happen is we try to build out these big fancy courses/programs without first asking if they are needed. We spend months building something out, then launch it just to have it flop. Then we move on to a new project and repeat this same cycle over and over. We have NO customer journey. What we need at this stage is an effective customer journey that allows us to bring new people into our community and then monetize them over a period of weeks and months until we ultimately bring them into a membership program that generates recurring revenue. The power of the One-Day Summit is that it lets us test out specific topics to determine if there is a need without wasting too much time and energy. It also allows us to build out an effective customer journey to provide us with real income. It opens up so many opportunities for collaboration with other experts through the networking that happens during a One-Day Summit. Additionally, having an audience, at this point we can use the power of the Premium – Monetization Strategy. Simply creating a quick One-Day Summit on a specific pain point with several quick solutions and then charging for access to it allows us to quickly start building some real revenue. This is why the One-Day Summit becomes the “Go-To” for all online businesses at this level. At this level of expertise, most businesses have great momentum, with lead generation and monetization strategies already working. What they are most commonly looking for is a way to scale to the next level without spending more of their time to accomplish it. The One-Day Summit becomes the knight in shining armor for these businesses as it allows you to create the summit once and then set it to “EVER-SUMMIT” status so that it continually brings in new qualified and engaged leads into your community to start their journey. It allows you to build multiple problem/solution specific One-Day Summits to cover an array of topics and areas. This casts a large and effective net to collect new subscribers while qualifying them as buyers quickly. Additionally, the One-Day Summit allows you to monetize that audience with the Premium-Monetization Strategy, directing them through the next steps of the customer journey. The best part of all this is that is all automated. Create it one time and then set it to repeat, ongoing forever! This is the easiest, quickest and most effective way to scale a business. Increased lead generation, boosted sales, more highly engaged and qualified customers, set to grow automatically? Yes, this is a top-rated strategy for influencers to scale to the next level. What are Some Examples One-Day Summits? 10 Tactical Strategies to build your list in 30 days! No fluff, no hocus pocus, or theoretical BS. Just straightforward, implementable and effective strategies. You want to build your list; we have the accelerator to help you do it. This One-Day Summit highlights the problem of building a list and brings in 10 list-building experts to teach a specific strategy. This is a free One-Day Summit focusing on List Building Strategy. This summit is used to collect emails of those who need help building a list and then offer them a solution afterwards with a program. Podcasting is so much more than just the number of downloads you receive each week. It’s about connecting with your audience and building lasting, meaningful relationships with your listeners. 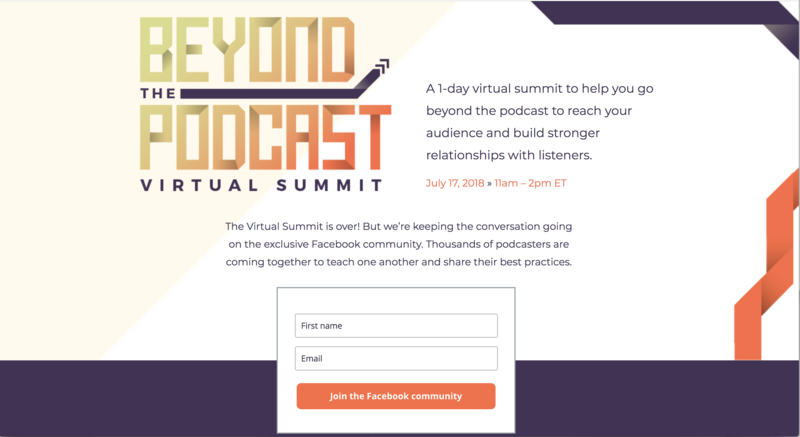 Whether you’re a professional podcaster or a hobbyist, Beyond the Podcast Virtual Summit will give you the tools and education you need to grow your podcast and allow you to connect with your audience in new and meaningful ways. This is a one-day summit put on by Aweber on the topic of Podcasting. It is used as a List-Building Strategy. This summit then creates interest and awareness about Awebers services to podcasters. Creating Impact, Authority, and Income through Speaking. 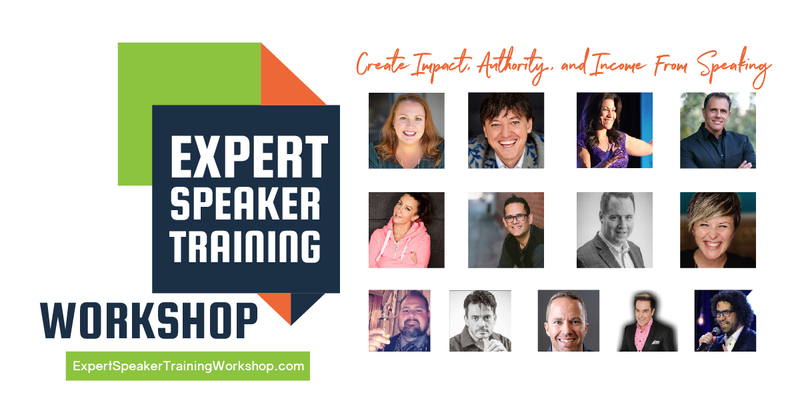 Thirteen world-renowned speakers, coaches and teachers giving you specific strategies to creating Impact, authority and Income! This is used as an affiliate promotion priming strategy. It generates quality engaged leads who are interested in speaking, then offers an affiliate speaking promotion to those attendees after the summit is over. Learn Neuro in a Day. Let’s stop making neurology overcomplicated. These 10 teaching sessions will help you learn neuro in a day! This was a One-Day Summit focuses on the “Premium-Monetization” strategy by requiring an initial payment to access information. 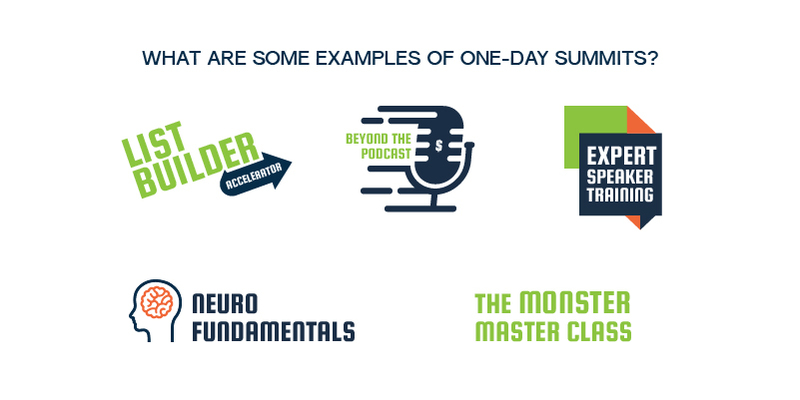 7 Experts – 3 Hours in the Monster Master class. 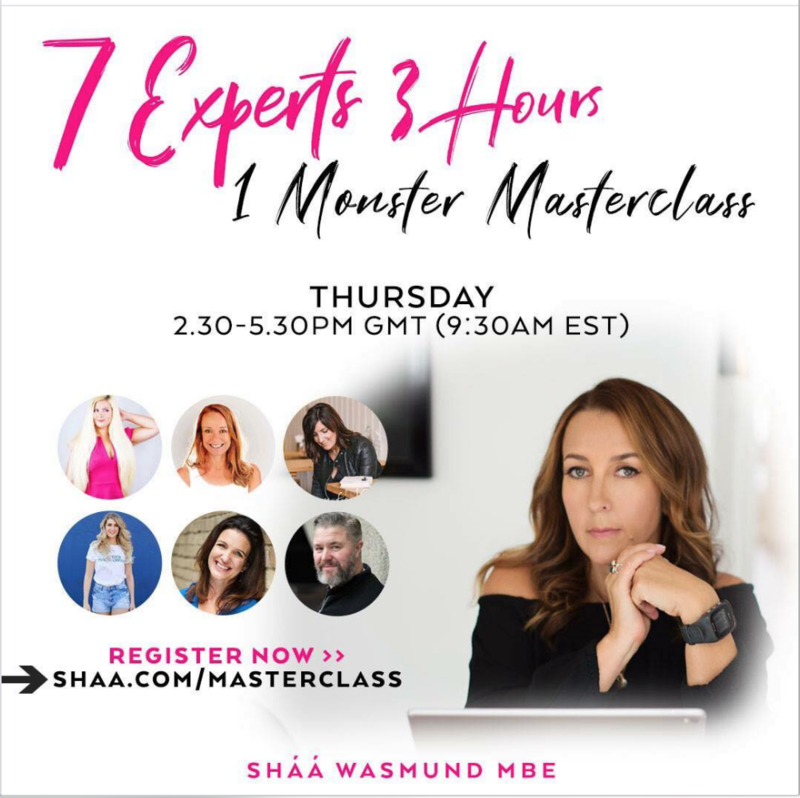 JOIN SHAA WASMUND, RUTH KUDZI, LISA JOHNSON, JOJO GRAHAM, KATYA VARBANOVA, KAREN KISSANE AND MATT THOMAS … ALL ON ONE MONSTER LIVE ONLINE MASTERCLASS. This is a One-Day Summit that focuses on creating awareness and excitement with teaching topics, then offers affiliate opportunities to purchase items offered by each speaker. 1 Day 5 Live Training covering 5 Ways to Scale Past $5,000 A Month in 2019. Speakers include Liz Bayardelle, Jaime Slutzky, Amanda Blakeman, Samantha Siffring, & Jenny Hale. 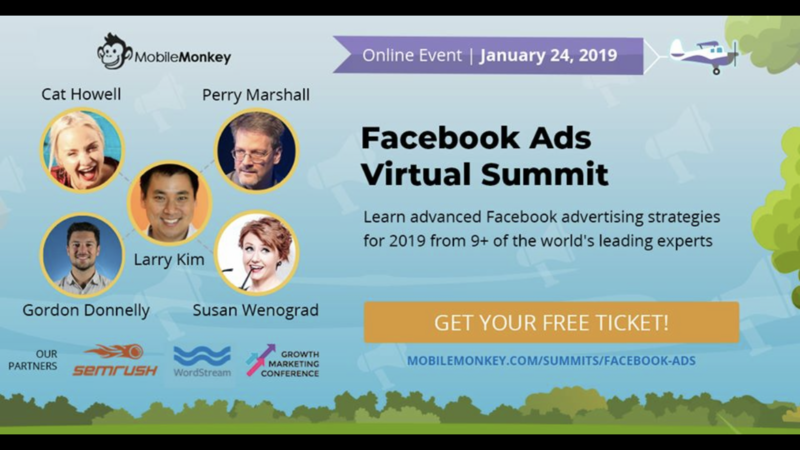 This One-Day Summit “Facebook Ads Virtual Summit” was created by Larry Kim. Facebook advertising campaigns offer one of the greatest returns on investment online. If you’re seeing lower impression share, costs rising and ads not converting, you’re not alone. In this summit, you’ll learn how to create ads that perform and learn advanced strategies that will massively grow your business. This One-Day Summit is focused on lead generation. Bringing in new leads by solving a specific problem, running Facebook Ads. Getting new engaged subscribers to sign up for this One-Day Summit. The good news about the One-Day Summit is that it’s all laid out already for you. After years of running my own successful summits, I had friends and mentors reach out asking me to help them run theirs. Fast forward a few years and now we have “The One-Day Summit Formula”. Combine that with the new Virtual Summits Software, and running a One-Day summit has never been easier. Our formula lays out the simple, yet powerful process of running a One-Day Summit. Often people will tell me, “Mark, this seems super easy,” and my response is, that’s the point. This isn’t about making me feel or look smart; it’s about showing you how you can quickly be successful. Because you can! Previously running any type of summit was only an option for an elite few influencers with the connections, big teams, large budgets, and ability to invest a small fortune into making one happen. Now, with the One-Day Summit Formula and Virtual Summits Software, everyone from newbies to experts is wielding the power and benefits of a One-Day Summit. Let’s walk through it so you understand exactly how to run your One-Day summit. There are 6 key sections to know about, and we can cover them super quick and easy. 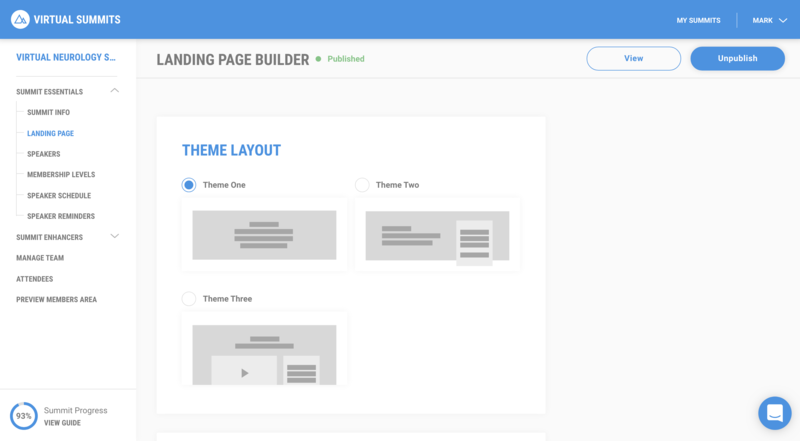 This is your opt in page with your theme, topic and all your key teaching sessions laid out in a way to highlight the problem, while showing the audience that they can and will get the solution to that problem in a short period of time. As is with any opt in page, copy, images, and strategy are important to increase conversions. Often a compelling video will help increase the conversion rate of those who opt in to your One-Day Summit. Another thing to think about is the timing of when to start running the promotions for your summit. Depending on your budget limit, you can start as far in advance as you want. 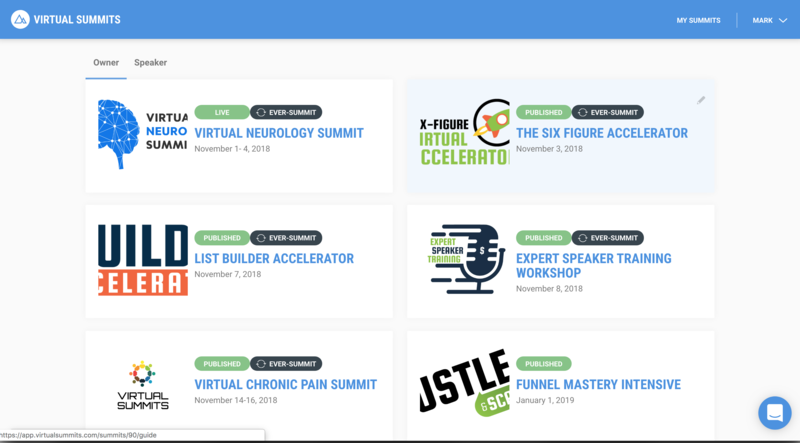 However, we have found that 4 weeks out is really the furthest to start promoting your One-Day Summit, with the largest conversions happening 2 weeks out and ultimately the week of the event. It’s not uncommon for us to simply run ads a week or two before and still have a great result. The next step in the One-Day Summit Formula is the confirmation and upsell page. This happens immediately after the attendee registers for your One-Day Summit. They are immediately shown a page that confirms their registration, gives them any necessary information and then offers something to purchase. Typically, the purchase (known as an upsell) will be an opportunity to purchase extended or lifetime access to the summit. There normally will be complimentary bonuses offered with this purchase to entice the attendee to want to “upgrade” and buy. At this point you will start your email communication sequences to begin educating your new subscribers. We will talk more about this in a later section. This is when the magic happens and you deliver the sessions to your attendees–typically positioned in one of two ways. The first being the division in two sessions, where they are split with half in the morning, and the other half in the afternoon. This creates more urgency inside of the actual summit to have your attendees get on board and consume the information. This also makes the content seem more consumable by splitting it up. The second option is an open forum where they can access all the videos at any time throughout the day and consume any session they want to watch. Both have their strategic reasons and either one is a good choice. However, there is always an ending time where the summit closes and access becomes restricted to anyone who has NOT upgraded to extended access. The most effective way to monetize the One-Day Summit is by having a closing time and then allowing replays to be purchased for extended access. After the summit ends, there is the option to grant a “Bonus Day” with a period of time to review the summit (without purchasing). This is based on the Rule of Reciprocity, allowing the attendees another attempt to consume the sessions and then to purchase extended access to the summit. This doesn’t need to be offered every time and is often best done as a surprise for maximum effect. Once the summit ends, we now want to encourage those who signed up for free to upgrade to a paid access level. There are several different urgency and scarcity strategies that can be used to increase sales conversions. Ultimately, the goal is to offer complimentary bonuses along with extended or lifetime access to the summit, while informing attendees of what will occur if they miss out on this opportunity. Typically, if they don’t purchase during this period of time, you would either completely remove their ability to purchase, or increase the price to a higher price point. The more value you can provide and the higher the urgency you can create, the more sales you will receive. This is the most valuable aspect of the entire One-Day Summit. This is the next promotion you will be offering to those who attended the One-Day Summit. The whole point of a One-Day Summit is to solve a problem and create a relationship with a new person. You want to create trust, demonstrate how you can help and provide the capability to decide if they want to take this business relationship to the next step on their journey. So, the “Turn” sets up the next promotion, which should be perfectly aligned with the theme and topic of the original One-Day Summit. This is the next step in the customer journey. We will talk about the specifics in a later section called the “Customer Journey”. This next step occurs congruently with the “Turn”. The Ever-Summit Protocol is the initiation of the automation of your One-Day Summit. Essentially, once your summit ends, it’s time to bring it back to life again. Previously, most people who run a summit use the summit as a product after it has ended. They use it for “upsells”, “down sells”, “flash sales”, “affiliate sales offers” and so on. This is a very beneficial reason to run a One-Day Summit as it gives you a valuable product in the end. The only problem and one of the most powerful aspects of a One-Day Summit is the ability to generate new subscribers. Once the summit is over, there is usually a very small amount of new signups. Why? Human psychology tells us that if something is over, or old, it is no longer valuable or good. Now we all know that this isn’t true, and that the information in the summit is as valuable today as it was yesterday. Nevertheless, it doesn’t matter; people quit opting in. At least that is what used to happen. Now thanks to the Virtual Summits Software, there is a powerful feature called “The Ever-Summit Feature”. With one click of a button, your old summit is transformed into a brand new, ongoing, live summit on a weekly, bi weekly, or monthly basis. Essentially you can click one button and the Virtual Summits Software will automate, run and track your summit as if it were live, forever. Hence, “Ever-Summit” is a Forever Summit. We will discuss this feature more in depth in the section on the Virtual Summits Software; however I needed to briefly explain it here so you can understand this step in the One-Day Summit Formula. At this point in the formula, you would evaluate your One-Day Summit results, determine any strategic updates or changes to optimize your Ever-Summit, and then initiate the Ever-Summit Protocol. Ideally, you are looking for ongoing ways to optimize your Ever-Summit traffic strategy as well. This now completes the loop in the One-Day Summit Formula, creating an ongoing, perpetual and powerful tool to collect new subscribers and income–hence one of the most powerful marketing strategies available today! Now that you understand the One-Day Summit Formula, how it runs, and the process that unleashes this power, the next step is to determine an effective choice for your One-Day Summit. There are 4 items to clarify to get you up and running with your very own One-Day Summit. The first step in creating your One-Day Summit is to come up with a theme. A very common problem that can be critical in the success or failure of your One-Day Summit is creating a too “general” or wide theme and topic. I have an entire training protocol available that walks you through this process if you want more in depth help. It’s a common mistake to believe that by casting a wider net, we will bring in more leads. This way when we provide them with the solution, you become their hero and a relationship is built. This is the simplified way to think about it. Major Category – Determine what industry or area you want to specialize in. A simple example would be “marketing”. Sub Category – Every Industry or area typically has some sub specialties. In the example above, we could consider “email marketing”, “Facebook marketing” or SEO generation. You need to begin to locate a specialty inside of your overall industry. Micro Category – Now that we have started the process of specializing, we need to take it to an even more specialized level. Staying in alignment with our current example, we could say under the Sub Category of “Facebook marketing” we could have a micro category in “lead generation” or “video views” or even “messenger bot marketing”. You see that there are plenty of areas we can narrow down and focus. Niche Specific – Lastly, we then determine our niche. This is simple. Who or what do you want to focus on? This could be specifically for your One-Day Summit or you could apply this same strategy to your whole business. In the example above, we could stay with “Facebook marketing” using “messenger bots for dentists”. Now we are finally where we need to be and ready for the next step. Now we are getting into one of the most important parts of the entire One-Day Summit strategy. Your topic, which will also most likely be the inspiration for your title, needs to be carefully selected. There is one key fundamental when selecting the topic — that is it needs to be based around your avatars number one problem for which a solution is sought. This is a common area of confusion. We often search for topics that sound interesting and popular or we use words to explain the issue different than the common terminology used by our avatar. Determining and selecting a powerful and correct topic is very important to the success of your One-Day Summit. Let’s start with selecting your avatar. You should have a pretty clear picture on this now after going through the theme selection process. However, you should make sure you are really clear who you want to target. If you don’t understand this, you won’t be able to clearly answer the remaining questions, which can cause your One-Day Summit to be off target and perform poorly. Start by looking at who you want to work with on a daily basis. What do some of your favorite clients currently look like? What do you like about them? Take all these items and narrow them down into one person. Get super specific: age, lifestyle, work, how many kids, their passions, etc. The more specific you can get on this, the better you will be in your business in general, but for sure in your summit. Write this down and keep adding to it as you learn more about your avatar. Now that we have narrowed down our avatar, we need to isolate their top problems. What is holding them up in their life or business? What are their top friction points? This is the key to being able to create a highly converting and valuable summit, because this problem is what you will create your summit around, while solving that problem. An easy way to find this out is simply to ask. Send out a survey or questionnaire to your current audience asking them to enumerate their top pain points. Create a poll on Social Media and in your groups. Get feedback directly from those you will be creating the summit for and use it in the creation of the summit. Occasionally, some find it a task difficult to come up with one top problem. If this is also difficult for you, then list out 3 – 5 problems that your avatar might have and simply select one of the options. The great part about this is that for every problem you list, you have an additional One-Day Summit to create, making your options and possibilities vast. Now that you have selected the problem, you becomes the topic and focus (and title) of your One-Day Summit. The more problem and pain-focused your topic/title, the higher the conversion rate will be for your opt ins. This is due to a normal psychological train called “The Framing Effect” (read more on this and the 12 other Psychological Triggers that make a One-Day Summit so powerful). This simply means that we emotionally value a loss more than we emotionally value a gain, even if they are of the same value. Now that we have isolated the focus (and Title) of the summit based on the top problem of our avatar, we can now move on to the next step–the sessions of our One-Day Summit. The next focus when building out your One-Day Summit is the actual content, or the sessions to be included in your summit. These are typically solution-focused, pre-recorded videos done with industry experts teaching the specific topic. The most common scenario is using speakers to teach these sessions, although it is okay to create a summit without them. In this situation, you, the host, would be leading each of the sessions. There is no right or wrong with this, and you can create a hybrid version as well. Next to each solution you have listed out, identify a couple of experts who would be ideal to teach on this topic. Identifying more is best in case any of them aren’t available to speak on your One-Day Summit. A typical One-Day Summit has between 5 – 16 sessions, with 10 being the most common. Again, there is no right or wrong answer here and creativity always improves success, so feel free to get imaginative. Now you have created your sessions and identified potential speakers for your One-Day Summit. There is only one thing left to do before you begin creating it. 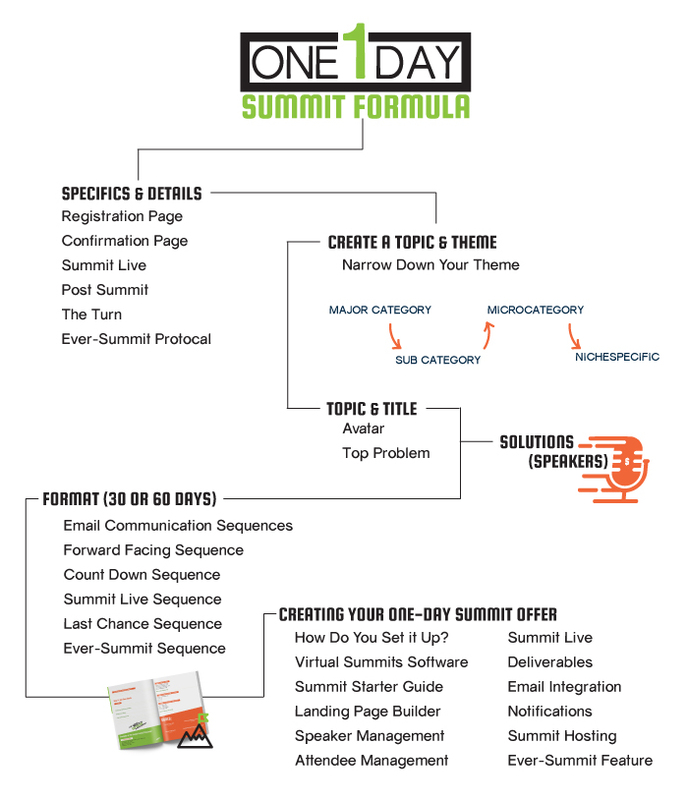 The last item to decide before starting to build your One-Day Summit is the format. This simple task is deciding how much time you need to get everything done to launch your One-Day Summit. We focus on two formats: 30 days from start to finish or 60 days from start to finish. Of course, you can take longer if you want and give yourself more time, but typically a One-Day Summit can be created in a very short period. One of the beneficial aspects of running a One-Day Summit is the speed of implementation. We have regularly created One-Day Summits in less than 30 days, our fastest from start to finish being 5 days. Obviously, we have years of experience and many connections that allow us to pull it together so quickly. You may need longer. The main point is to know that you can do it quickly and efficiently. In my One-Day Summit Formula Online Training, we include two calendars (a 30 day and a 60 day) that actually list out each task and what day they need to be started/completed. You can learn more about my Online Training here. This wraps up the 4 main components of brainstorming your One-Day Summit Strategy. Hopefully, you have started to craft several ideas to build out your own unique One-Day Summit. Now let’s get into some of the details. Now that you have your One-Day Summit idea, it’s time to get into some of the specifics of running it. The next most important aspect of summit success is communication campaigns. It’s common for those running a summit to want email templates they can just copy and paste. While there may be some out there, it’s highly ineffective to use this method. Every summit is unique and individual; using a standard template will almost undoubtedly decrease its success. That being said, there is some good news. We have made it as easy as possible to create your own email campaigns, having evaluated some of the most effective sequences and strategies. We have sent out tens of thousands of our own emails, testing what works and what doesn’t. In the end, we have narrowed it down to a very simple framework of 5 specific campaign types. I will go over these campaigns now. 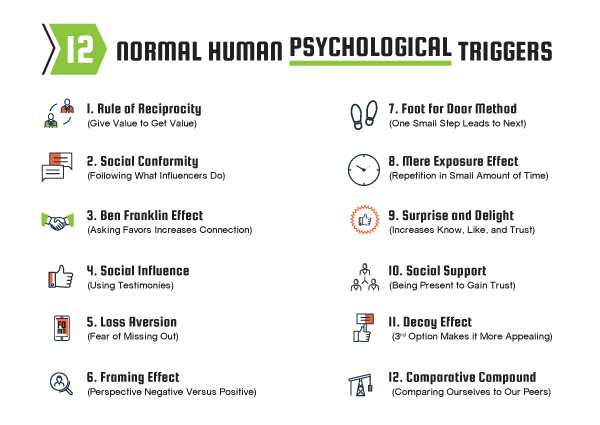 Inside my One-Day Summit Formula Online Program, we go through the specifics of these sequences, even describing which of the 12 Psychological Triggers should be included in each campaign. You can get more information on this online program here! I refer to this as the “Indoctrination Campaign” based on the purpose of this email sequence. The sequence initiates as soon as someone registers for your summit. The overall purpose of this campaign is to indoctrinate or educate the attendee of your vision, mission, and goals on how you want to make the world a better place. The campaign will start as soon as the person registers and can generate anywhere from 4 – 10+ emails ongoing. Since this is an education campaign specifically on what you are about and the purpose of you/your company, it doesn’t matter if they get these emails before, during or even after the summit ends. The specific goal with this sequence is to begin building a relationship between you and your new subscriber. This is referred to as the “Sales Campaign”. This email sequence initiates at the same time as the Forward Facing Sequence and is focused on two priorities. The first is to give the person all the information they need to be successful with your One-Day Summit. The second is to encourage them to take advantage of the offer you are selling along with your One-Day Summit. Depending on whether you are using Virtual Summits Software or have tried to “Frankenstein” your summit together with various other software, this may not contain much detail on how to access your summit, other than reminding them about when it is starting, who is speaking, and giving them access to any deliverables they need for the summit, such as a workbook. However, it is important to make this process as easy as possible for your attendees and be sure to send them ample reminders so they don’t forget or miss the summit. The sales sequence typically gives the attendee an opportunity to get your offer at either a slightly reduced price, or with some bonuses that will be disappearing, as it gets closer to the summit going live. This is called an “early bird” sale or a “diminishing bonus” offer. The main point is simply to encourage urgency to purchase your offer. We will discuss the offer in more detail shortly. For now, the idea is to have a sequence that starts as soon as the attendee registers for your summit and is time sensitive. Meaning they need to get this information before the summit starts and ideally limited to a few emails that go out before it goes live. This email campaign is pretty straightforward and simple. It goes live when your One-Day Summit goes live. It is typically 3 – 4 emails spread throughout your summit, letting people know that it has started, is still going, and is ending. The main focus of this campaign is to get your attendees to show up to the summit and access the sessions as well as to purchase any promotions available. Occasionally, if you offer a “Bonus Day”, you will include those emails in this sequence to inform attendees of any additional time you have given them to access the summit sessions as a “bonus” even though the summit has ended. A bonus Day is a good way to increase conversions using the “Rule of Reciprocity” trigger. You would typically give access for a few hours the following day. Sending out an email or two the day you do this is beneficial to let your attendees know they have access. As the name implies, this email campaign focuses on increasing urgency with a limited time opportunity to take advantage of your offer. This is usually 1 – 3 days after your summit ends and includes some type of price increase or complete removal of the offer altogether. The only focus of this email campaign is to encourage the sale. This will typically include 2 – 3 emails each day focusing on the value and loss that will happen if the attendee doesn’t take action to purchase the summit. The more focused the summit is on an acute pain point that the attendee is currently suffering from, the higher the conversions that will occur. This is more of an update and automation process than a brand new campaign. Once your One-Day Summit has ended, you will want to initiate the Ever-Summit protocol using the Virtual Summits Software feature that allows you to run your summit on an automated basis, ongoing forever, as if it were live. This feature makes your summit the most valuable marketing tool you have by bringing in new leads and sales, ongoing forever. In regard to the email campaign, you will need to go back through and neutralize your emails, removing any date/day/season wording that potentially does not align with the new campaign. Since the emails will be automated moving forward, you need to ensure the emails still make sense no matter what day of the week or time of the year. It’s that simple. Now you have a full One-Day Summit email campaign strategy. Use your own words, language, brand, and personality and you will have a successful One-Day Summit Email Sequence ready to rock & roll! 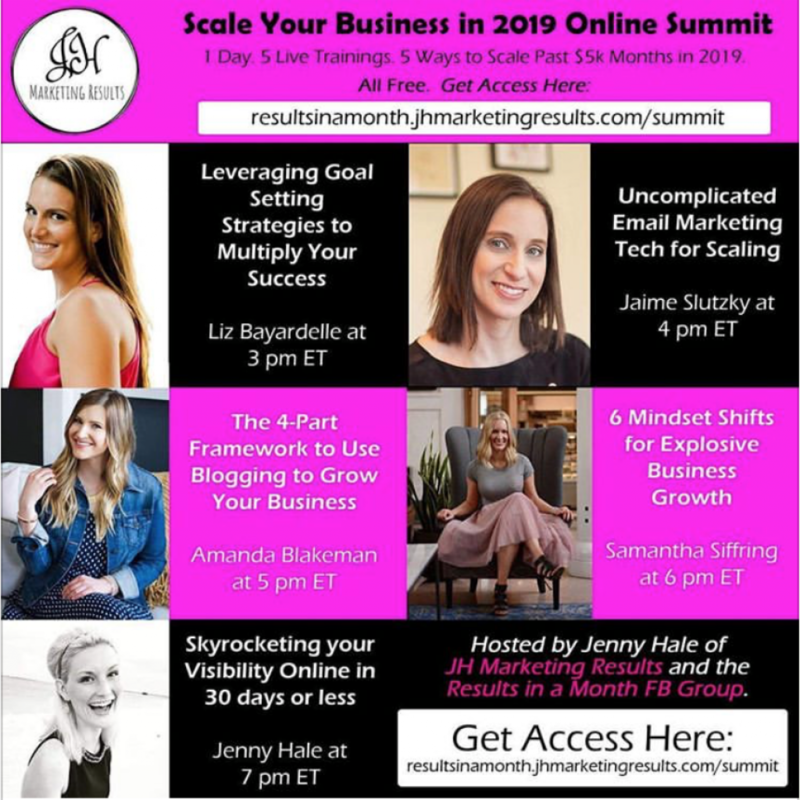 Once you have your strategy built out and understand the email communication sequences, the last foundational component to a successful One-Day Summit is the offer. I have mentioned it before, but it is worth repeating: the more creative you can be with your summit and offer, the more successful it will be. When creating your offer, it needs to be perfectly aligned with the problem being solved by your summit. 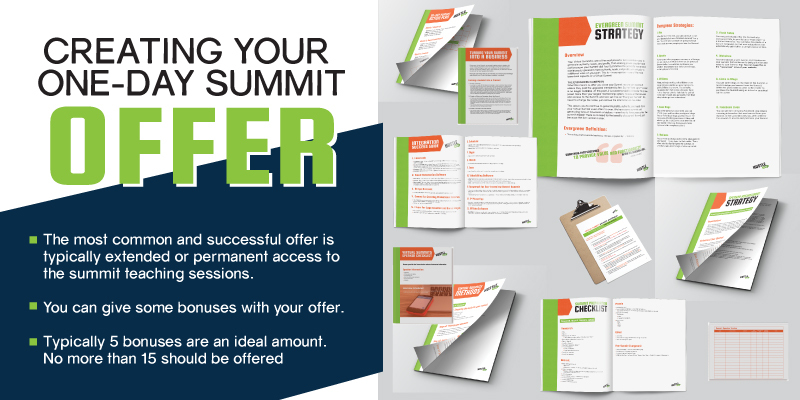 The most common and successful offer is typically extended or permanent access to the summit teaching sessions. Most attendees will not be able to consume all of the sessions in the time frame available. A few will miss it all together. Some will even know when they register that they won’t be able to attend the actual summit. What they want and need is extended access to the sessions. So, the most common and effective offer is simply giving lifetime access to the summit teaching sessions. Additionally, you can give some bonuses with your offer. These should be items that support and improve your current offer. They could be guides, resources, cheat sheets, or even access to courses. Many times, speakers will offer digital resources included in the offer as bonuses. Typically 5 bonuses are an ideal amount. No more than 15 should be offered, as it begins to overwhelm the potential customer. Make it an offer so simple and valuable that it would be impossible to say no. Most One-Day Summits will offer 2 – 3 pricing options, the smallest being the simplest with just extended access to the sessions and maybe one bonus. The second would be a higher price point with more bonuses offered. 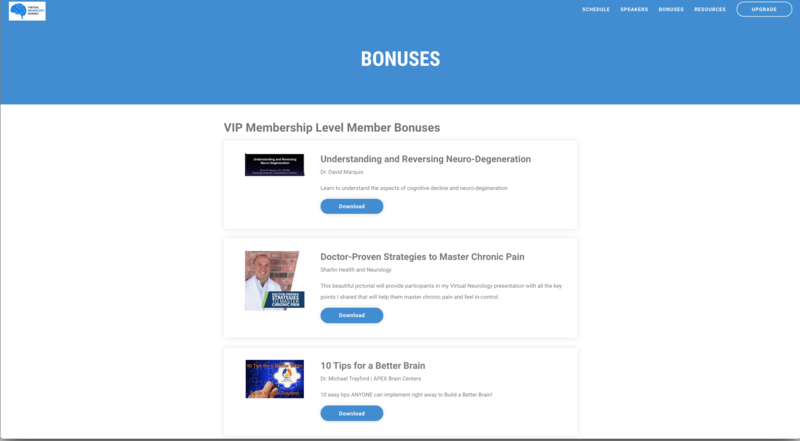 You can see a good example of an offer with bonuses on the List Builder Accelerator. At this point, you are probably ready to rock your very own One-Day Summit. There may be one last question remaining, “How do I actually build and run a One-Day Summit”? A very important question, and depending on how you approach it, it could be the difference between months and months of work costing thousands and thousands of dollars, or not. This is why I always recommend “Virtual Summits Software” to anyone looking to run a summit. Before we actually get into the details and features of this software, it is important to know how this software has changed the playing field for entrepreneurs across the globe. I have been running One-Day Summits and traditional multi day Virtual Summits for over 5 years. When I ran my first, it took me 7 complex and expensive different types of software, plus 26 plug-ins to build out a single summit. It cost me over $7,000 to build, and this was without getting any help from a developer or web designer. Later on, it would cost me up to $10,000 to hire out this part of building the summit. It took me 4 months of work, averaging 20 hours a week, totaling over 300 hours. It was honestly one of the most complex, difficult and frustrating things I had ever done, but these summits were so powerful that I couldn’t stop running them. Summits literally allowed me to build a multi-million dollar business. Eventually, I hired a team of 4 people to work on these summits full time, since we were running 2 – 3 traditional summits and 4-6 One-Day Summits a year. I spent a small fortune to do them, but every one brought in an exponential amount of income, sometimes equaling over a quarter of a million dollars per summit. Now there are plenty of Virtual Summit Consultants that charge anywhere from $7,000 – $15,000 to set up and run your summit. There is even a successful company that runs summits for healthcare professionals. They charge between $35,000 – $50,000 PER SUMMIT! The crazy thing is they are constantly booked out. This is because of the POWER of summits. But what if there were a simpler solution. One that didn’t cost 10s of thousands of dollars. A solution that didn’t require a costly team to build it out or require an advanced knowledge of tech & coding. That is what I kept thinking to myself. Why isn’t there a simple, affordable and reliable way to run a (One-Day) Summits? That is when Virtual Summits Software became a reality. Virtual Summits Software makes hosting a summit easier than EVER before. It was built specifically for summits by people who run summits. It is the ONLY software in the world designed solely for running Virtual Summits. It’s fast, simple, easy, reliable—and affordable. Summits are no longer reserved to those entrepreneurs with big teams, big budgets and endless resources. It’s now available to all. This software is a plug and play option that allows anyone with zero tech knowledge to run an effective and successful summit. It integrates with your email management software and stripe account. There are no limits, overage fees, or nickel and diming anyone. Simply pick which option works best for you and get busy building your very own summit. You will see that the software does offer some amazing features. 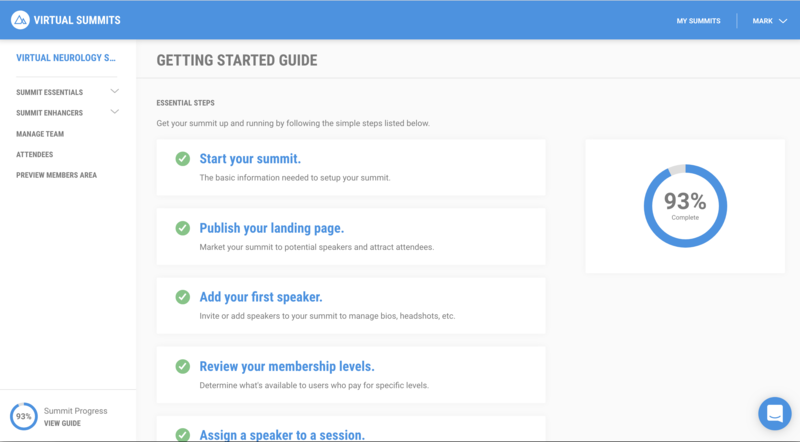 Making it even simpler to build your own One-Day Summit is the Summit Starter Guide. This is built into every summit, giving the host a simple guide to follow to create his or her own successful event. A simple, traceable way to manage your speakers, saving you hundreds of hours of time management. 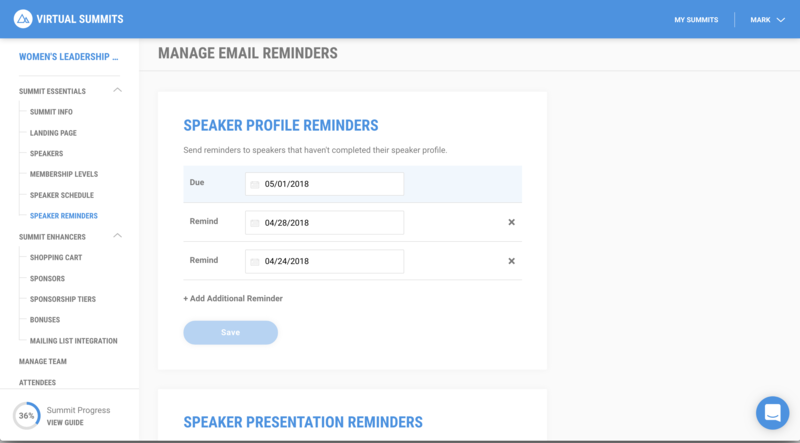 The software gives your speakers access to fill out their personal information, while following up with those who haven’t completed it yet, thus increasing speaker completion rate. You can rearrange speaker ordering, hide speakers, and quickly add them to the schedule for the live summit. Everything completed by the speaker’s populates throughout the entire summit, minimizing the time required to build it. Quickly manage all the attendees registered for your summit. Give them access to different levels. 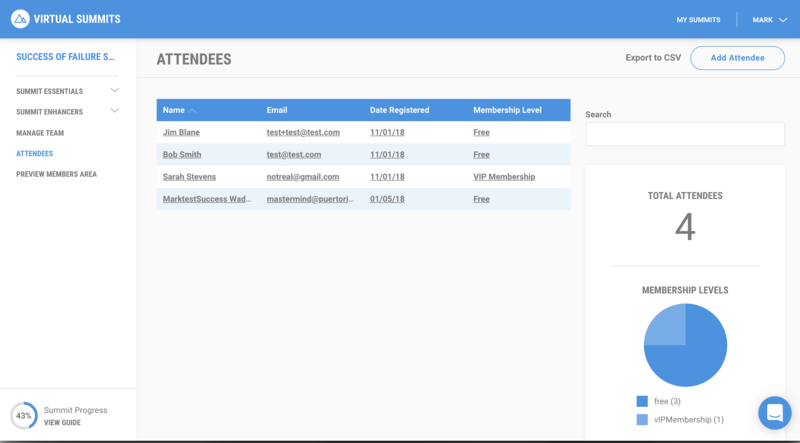 Add a single attendee or a list of them to your summit. Export the attendee list as needed. Quickly see an overview of how many people have registered at the different levels. One of the most powerful and beneficial features of the Virtual Summit Software is its ability to run the summit automated. Once your summit is created, the software will run and manage everything including unlocking and locking different sessions based on the information you have inserted. It immediately unlocks the different bonuses and sessions based on whether an attendee pays for the upgraded level. It gives attendees access to everything they need right on one platform. It makes it so easy to run a summit. 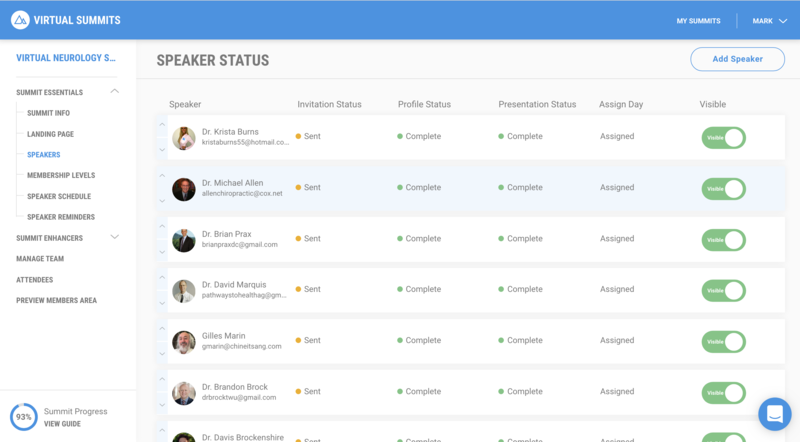 The software handles deliverables automatically for your attendees. The bonuses inserted into the software are immediately accessible inside the summit software. 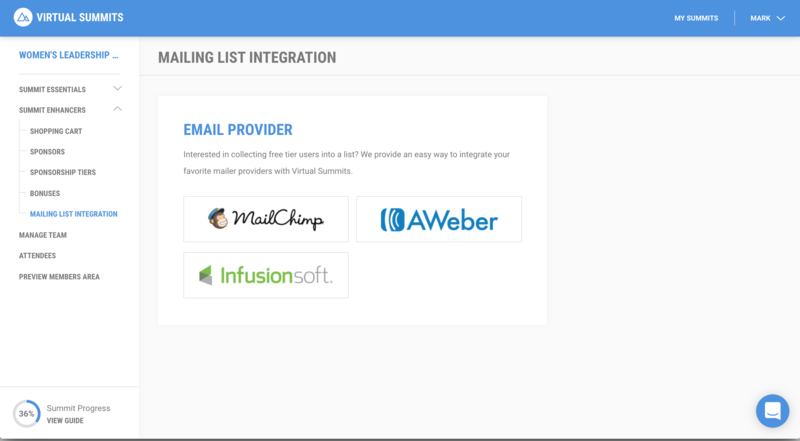 Connect your own email integrations such as MailChimp, Aweber and Infusionsoft, and more so that each new attendee is automatically inserted into a custom list, allowing you to follow up with automated email sequences. The Virtual Summits Software ensures your attendees don’t miss the summit by sending out notifications throughout the event. This increases the likelihood of the attendees accessing and viewing your summit. All your summits are in one simple and easy to access location. Once you run your first summit, you will be eager to start your next one. This software makes it easy to manage multiple summits by giving you access to a dashboard with all the summits located in one place. You can quickly edit an individual summit, or even archive and delete previous summits as desired. Arguably the most powerful feature of the entire software is the Ever-Summit Feature. Once your summit has ended, you can choose to run it once a week, twice a month, or monthly with the Ever-Summit feature. This automates and runs your summit as if it were live, ongoing forever (or until you choose to stop it). It updates dates and notifications automatically. It tracks attendees and runs the summit as if it were live with each one. Then it tracks whether they have completed the summit, making it impossible for them to re-access the summit unless they upgrade. This single feature has revolutionized the power of Virtual Summits for everyone. To see a full demo of the Virtual Summits Software and all the features included in it, go here. What Are Other Ways to Use a One-Day Summit (Plug & Play)? One of the fascinating things about a One-Day Summit is how versatile and powerful it is are in all aspects of an online business. Most online marketing strategies have a singular purpose such as list augmentation, monetization, or relationship building. A One-Day Summit can do them all, and it increases the success of any promotions you are considering to run. I have created frameworks for some of the most popular objectives in online marketing. The following strategies follow a general framework that demonstrates how to take a One-Day Summit from a generic one-time event and turn it into one of the most powerful marketing tools for any and all marketing campaigns you will ever run. The framework flow starts with a mindset. You must first start by knowing the end goal in mind and access the exact purpose of a One-Day Summit based on your objective. Once you understand this, you can begin the preparation. Many times this requires further research or understanding of other programs to determine how you will create your One-Day Summit. This brings us to the next step in the framework, which is the creation of your One-Day Summit. This will align specifically with the outcome expected. How you create and run your One-Day Summit will vary depending on the aligned objective. Once the summit is created, you will then run it to recruit a new audience. After you have built the audience, your focus becomes increasing the relationship and engagement with a focus on priming them for the next step in the framework. The final step is to guide them in the direction of the end goal. This might be to promote, launch or initiate a new promotion. Using a Plug and Play framework increases the success of the end objective exponentially. It ultimately changes how you view your marketing and sales promotion strategies, providing a simple and quick way to dramatically boost success. Now I will overview each of the Plug and Play strategies. 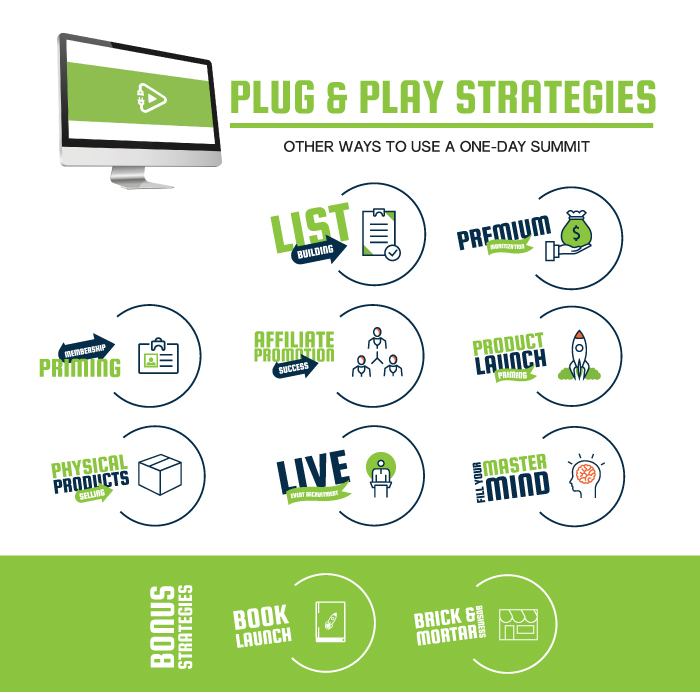 For more information specifically on Plug and Play Summit Success Strategies and to download the full Plug and Play Success Guide, go here. Overview: Increasing conversions by offering a free One-Day Summit to build your list by offering a solution to an acute problem in a very short amount of time. Overview: Generating income by offering a premium One-Day Summit that requires payment for entry. 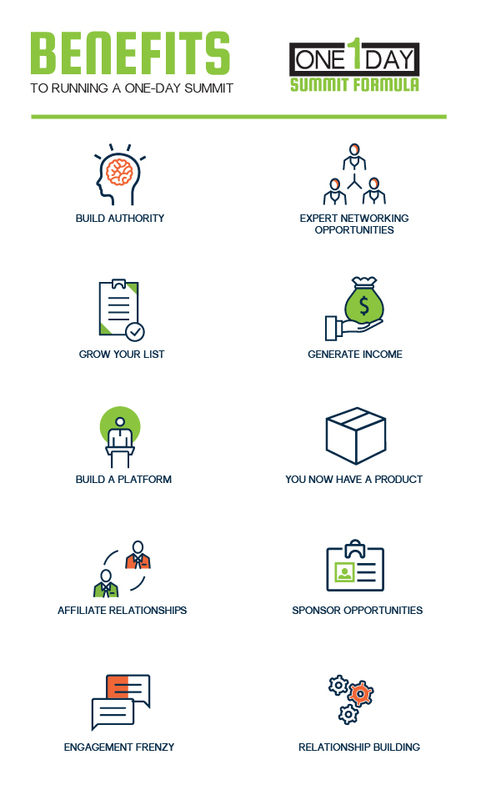 Overview: Positioning a One-Day Summit aligned with the exact problem the affiliate product solves in order to generate qualified and engaged leads that will be interested in purchasing the affiliate product. Overview: Increasing “know-like-trust”, while stimulating interest in a membership program by using a One-Day Summit to touch on each of the pain and success points of the membership program. Overview: Start increasing anticipation for the end program, using a One-Day Summit to highlight awareness of the overarching problem. Overview: Generating engaged and qualified buyers in need of a physical solution by using a One-Day Summit to showcase the different solutions the physical product can offer. Overview: Showcasing the speaker’s expertise and energy through a One-Day Summit to increase motivation to attend a live event featuring that speaker. Overview: Highlighting the success strategies offered in an exclusive mastermind through a One-Day Summit to generate the motivation to join the mastermind. 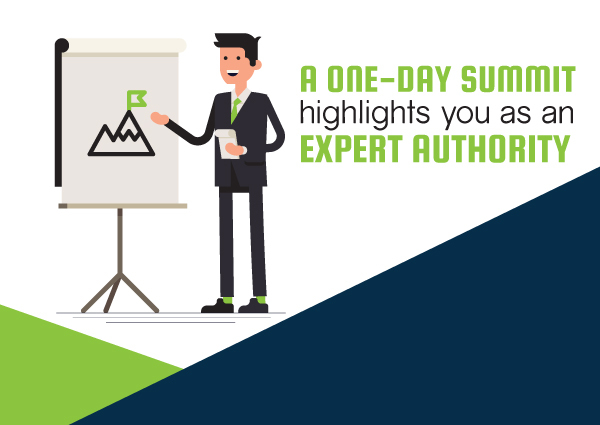 Overview: Engage potential affiliates while creating awareness and momentum of specific aspects of your book through a One-Day Summit in preparation for your book launch. These are the main Plug and Play strategies you can simply insert into a One-Day Summit with the outcome of a dramatic increase in the success of the promotion. You can simply take a One-Day Summit following these frameworks and add it to almost any promotion you want to run and watch the result of that promotion skyrocket! -Any time you can build the relationship with your audience while gaining expert leverage, you can expect an improvement in results. For more information on these Plug and Play Strategies, and to see a specific example of these strategies in action, click here. Download all the strategies along with the specific frameworks of each category to begin implementing them into your own promotions. How Can I Monetize a One-Day Summit? The two most common reasons entrepreneurs run a One-Day Summit is to build their list and to make more money. Using the Plug and Play Strategies described above opens up opportunities to increase the power of your One-Day Summit on the front end. However, having a strategy built correctly to continue that journey would increase your success on the back end as well. While a One-Day Summit can surely make money as a stand alone strategy, combining it with my Customer Journey strategy, you will be able to grow and scale any business quickly. I like to call this the Hustle To Scale Framework which is a step-by-step process following human psychology to build a more effective customer journey. There are four primary phases in the customer journey, each specifically designed to increase the relationship with your audience while solving their problems. That is the most important aspect of any business, and if done correctly, will allow you to scale your business to six and seven figures. You can download my Hustle To Scale Blueprint here. 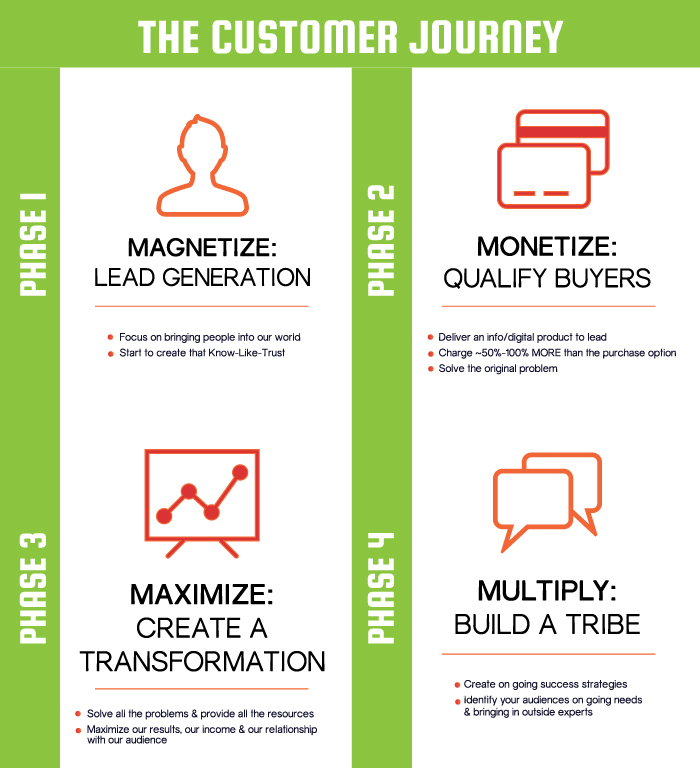 Phase One in the customer journey is the Magnetization Phase, where we begin building the relationship process with potential clients. We need to build “know-like-trust” with them. The best way to do this is with a One-Day Summit. The first step is to build a relationship and solve their most acute problem. Using a One-Day Summit allows them to spend time with you, while increasing your authority through the expert leverage of the speakers acquired for your One-Day Summit. Although monetization of a One-Day Summit is common with a “premium” summit strategy, the top focus is usually on lead generation and relationship building. A One-Day Summit always generates income through upgrade promotions, making them one of the only marketing strategies where the lead generation pays for itself. This happens from attendees purchasing extended access, making the cost of the leads free or very low priced. In Phase Two, we deliver an info/digital product to the now warm lead that is directly related to the original problem they opted in for. Typically, this is in the form of an online course, but it doesn’t have to be limited to that. From a pricing prospective, we are going to charge approximately 50%-100% MORE than the purchase option presented in Phase One. This will typically fall anywhere from 7 – 14 days after the Magnetization Phase. The most important point here is that the course solves in a single step-by-step fashion the original problem that the subscriber opted in for in Phase One. Now we are taking the warm leads and turning them into Hot Customers. We have qualified our buyers and created an even more engaged audience, while continuing to build “know-like-trust”. It’s time for Phase Three (Maximization). It’s time to create a Transformation. In the previous phase, we solved a single problem. Now in this phase we are going to solve all the problems and provide the resources needed to successfully create this transformation. Most commonly this is done through a digital product, but it can be created in any format that resonates best with your audience. This could be a live event, coaching program, mastermind group, or anything that allows you to create the transformation needed for your audience. Since this is a much more involved process and creates a much more significant outcome, we are going to charge a high ticket price point. This should be anywhere from 1,000%- 10,000% more than your original price point. In Phase 3 we are maximizing our results, our income and our relationship with our audience. Our client should at this point be moving from Hot Customer to Nuclear Fan (or Raving Fan). The final component is Phase 4, the Multiply phase. 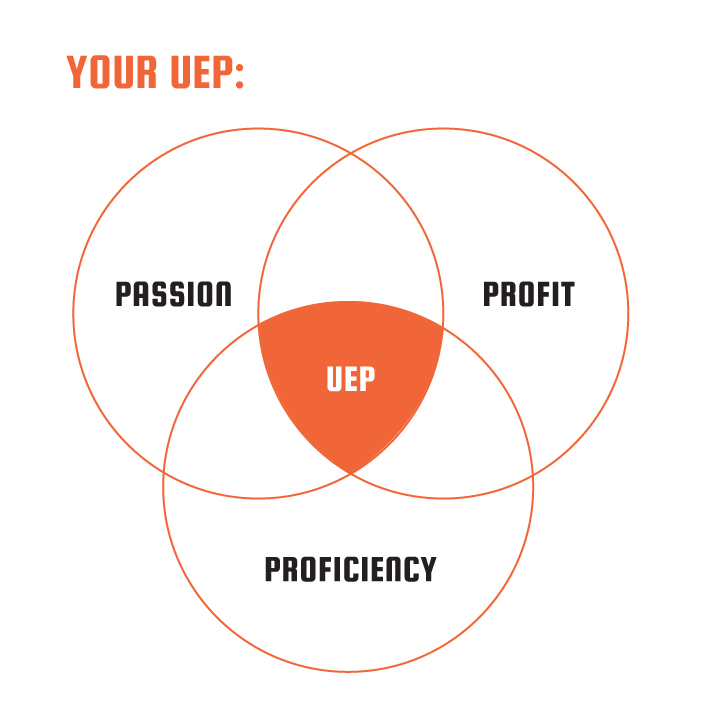 This is where we build our tribe and create ongoing success strategies for our audience. The most common misconception here is that you should be the one solving your audience’s problems and coming up with all the solutions. In this phase, you should be identifying your audience’s ongoing needs and bringing in outside experts into your community to allow your tribe to have access to new and effective success strategies. You need to provide a community where your tribe can get their problems solved. This is what will keep them coming back to you forever and create an engaged and satisfied group. Phase Four (Multiply) is about membership and creating recurring revenue. This is a commonly overlooked, or avoided area in online businesses. However, without recurring revenue, your business is just one bad month away from failure. Follow this straightforward and simple framework to build a scalable online business. When you put this together you will be able to generate more income, quicker and easier than ever before. This is what it is all about. You can then continually go back and review your results, tweak, change and improve where needed to perfect the flow of the customer journey. Additionally, when you are ready, you can create additional frameworks targeting different problems and pain points, eventually creating multiple flows of customer journeys. 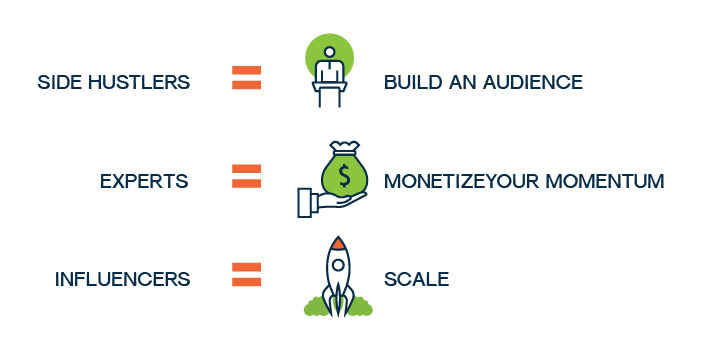 Ideally you will have 2-10 of these Hustle To Scale frameworks, each generating 5 – 7 figures. Together with the One-Day Summit Formula, you will have a successful, scalable online business that makes you happy and creates a tribe of raving fans! If you want my guide for the Hustle To Scale Framework so you can build out your Hustle To Scale action plan, you can grab it here for free! Now that you know the Hustle To Scale Framework, you can see how bringing your One-Day Summit into the process will build a powerful customer journey. Even at this point, one common problem that must be overcome is automation. Most entrepreneurs must create something new every month to continually feed the beast– their business. The only way to truly scale a business is to build automated systems that allow it to grow without having to constantly produce more. The tradeoff is that most automated strategies don’t perform well enough to keep the business running at the same level. Until now! 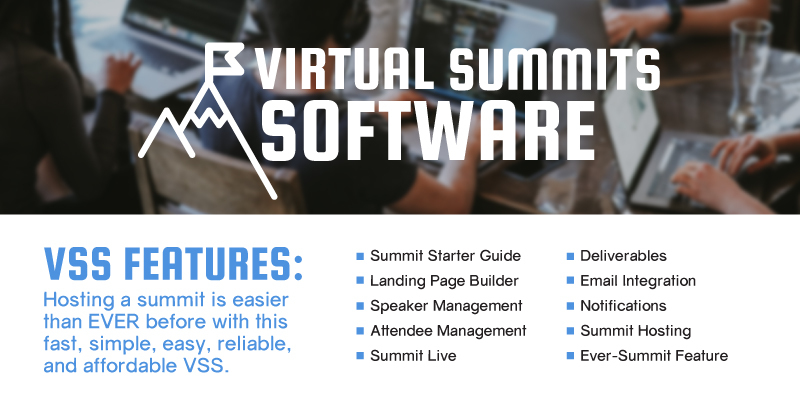 The Virtual Summits Software has a revolutionary new feature called the “Ever-Summit” feature. This new feature has changed everything. Previously when someone would run a summit, it would end when the particular summit ended. Now with one click of a button, the summit automatically runs as if it were live, ongoing forever. By selecting one button, you decide if you want it to run once a week, twice a month, or once a month. Then the software automatically converts the summit to a live summit, running and tracking everything automatically. This allows you to build your One-Day Summit one time, but use it over and over, ongoing forever. Now for the first time, you have an effective and powerful marketing strategy that never expires, but instead brings in new leads, generates money and builds relationships with your audience on an ongoing basis. This feature allows you to create an Ever-Summit Protocol focusing on traffic and optimization. Since the One-Day Summit will be running ongoing, you can look at traffic sources that wouldn’t have been available otherwise. Instead of just paid ads, you can now generate permanent traffic such as blogs, podcasts, videos, and even webpages/resource pages dedicated to driving traffic to your now “Ever-Summit” One-Day Summit. Additionally, since you can now see how the One-Day Summit is converting on an ongoing basis, you can begin to optimize the summit by testing things such as copy, color, speaker headshots, images and even offers. The Ever-Summit Protocol from the Virtual Summits Software gives the power back to entrepreneurs, allowing them to create effective strategies that last forever. Now you can create multiple streams of these One-Day Summits targeted towards the Hustle To Scale Framework (customer journey), which will allow you to build and grow your businesses quicker, and with less work. To learn more about the Ever-Summit strategies, you can get information here. As we come to an end of what is the most in-depth and thorough overview of a One-Day Summit and all the success strategies that stem from it, you can see how beneficial and powerful this marketing strategy truly is. While you may have a feeling of overwhelm with all this information, keep in mind that the best way to learn is by doing. For a more in-depth training session on this strategy, you can see a video training I did here for a group of entrepreneurs looking to grow their businesses. This training covers all of these aspects with video examples for those who would like to see what it looks like in the process. Just know that after helping hundreds of entrepreneurs implement these strategies, I am positive that you will be able to quickly and easily create your own successful One-Day Summit. Then you, too, will be able to wield the most powerful marketing strategy on the planet. 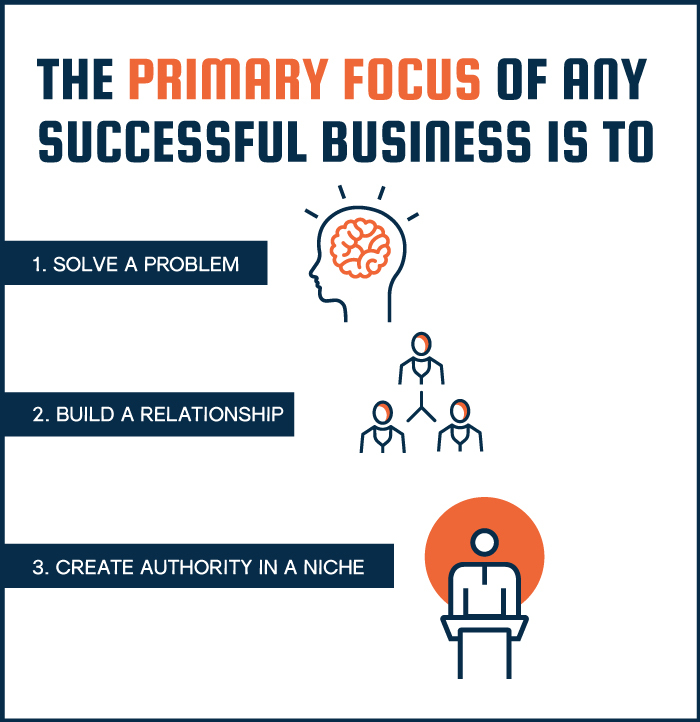 In conclusion, the primary focus of any successful business is to solve a problem, build a relationship and create authority in a niche. The One-Day Summit, combined with the power of Virtual Summits Software, provides exactly that. Whether you are a brand new entrepreneur or a seasoned influencer, the One-Day Summit Formula will help you get to the next level. Dr. Mark T. Wade is a Postural Neurologist with two doctorates, 50+ Certifications whom went from a successful brick and mortar clinic to an online multi-million dollar education business in the health space. 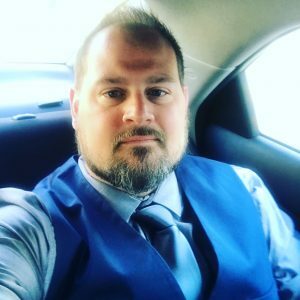 He has created a top-rated podcast, a sold out mastermind for entrepreneurs, featuring the likes of John Lee Dumas, Pat Flynn, Lewis Howes and Jeff Walker, and a one-of-a kind SAAS company called Virtual Summits Software. With his brand, HustleAndScale.com, Dr. Mark helps entrepreneurs scale their side hustles with a technique called the One-Day Summit Formula–the same strategy he used to build that multi-million-dollar business in the health space. (Still a success today: American Posture Institute). It’s one of the top online marketing techniques available and works for beginners, influencers and even brick and mortar businesses. Read more here about Dr. Mark T Wade and his journey from humble beginnings to creating multiple six and seven-figure companies. Don’t just sit there. Get busy building your One-Day Summit. Here are some resources that will help you in the process of building out your One-Day Summit and customer journey. 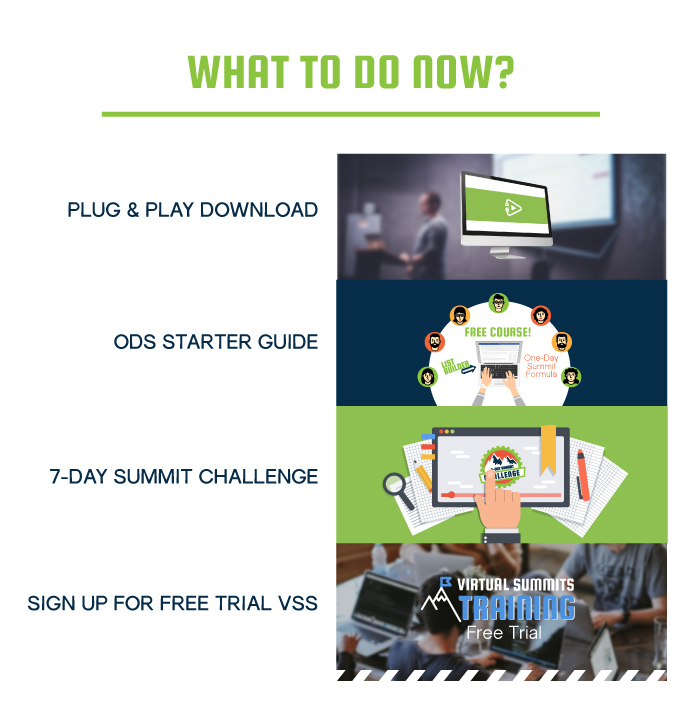 Want to try out the Virtual Summits Software for free? Click the link above to get access to a limited time opportunity to try it out. Download all 10 of the One-Day Summit Plug and Play Success Strategies. This guide includes an overview of each strategy, plus the specific framework in detail. 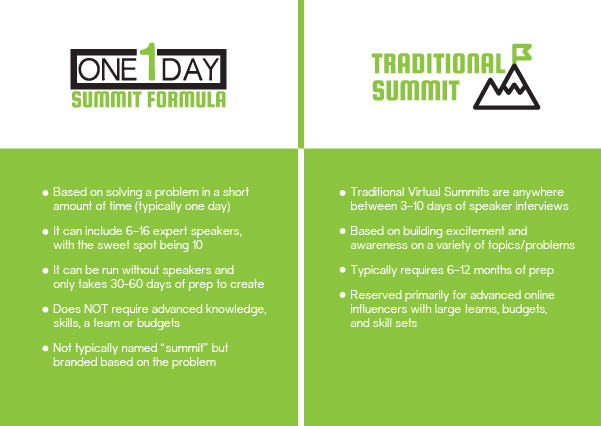 Get access to my One-Day Summit Starter Guide, which covers how to get started building your One-Day Summit, plus downloadable resources such as the One-Day Summit Formula PDF and Strategy Worksheet. Need some accountability or want to work through the process with a group through guided instructions? Then join our next 7-Day Summit challenge and build your One-Day Summit in less than 7 days! Access this in-depth master class training with Dr. Mark T. Wade teaching a group of entrepreneurs how to build their One-Day Summit Strategy, customer journey and implementing the Plug and Play Success Strategies. Dr. Mark T. Wade is available for both virtual and in person speaking opportunities. Contact us here to have Dr. Mark speak at your conference, mastermind, podcast or summit. Earn extra income by simply recommending the number one virtual summits software in the world. Help your students, colleagues, friends learn about this amazing tool and earn commissions in the process. Learn more about our affiliate program here.